I haven’t been reading many new-to-me books lately; I’ve been re-reading the Touchstone Trilogy and bits of Cyteen and Regenesis instead. But, as I work my way through fiddly revisions of this and that, and also experience epiphanies about my actual supposed WIP and pick that back up, I have also started very slowly tackling my physical TBR pile. Which consists of three short shelves plus a longish row of books on the floor, and this summer I would like to whittle that down until nothing is on the floor. May be too ambitious a goal, we’ll see. Also, I have despaired of ever being in the mood to read some of the books on my physical TBR pile, so I am trying out a new strategy: I shut my eyes, run my hand along the shelves, and pick a book totally at random. Even if I’m not in the mood, I start reading that book. If I don’t think I like it, I will keep going a little or skip ahead and try again so that I feel like I’ve given the book a fair try. I will have a comment about this method in a later post, but for now I want to focus on Bitterblue by Kristin Cashore. I will start by saying that although I liked the first book, Graceling, I really did not think it was all that and a bag of chips. I thought the characters were pretty typical, the plot fairly predictable, the fundamental worldbuilding fairly unbelievable, and the actual storytelling good enough to carry me along through the story anyway. I didn’t read the second book, Fire, because it just did not sound as though it would be something I would like. Bitterblue, on the other hand, did. Where Graceling was if anything too straightforward, Bitterblue is thoroughly confusing. I mean that in a good way. For a long time, nothing makes sense, to Bitterblue or the reader. The palace is so weird and confusing and everyone who lives in it is also weird and confusing, from servant girls like Fox to important advisers like Thiel and everyone in between. All these weird, confusing things happen, both within the palace and out in the city. The reader is likely to sort all this out and come to certain disturbing conclusions about Leck’s past activities well before Bitterblue does, which is reasonable because not only is Bitterblue in the middle of events, not only is almost everyone — every Monsean, anyway — looking her in the eye and lying to her, she also doesn’t have that depraved an imagination. She sure tries hard, but she’s so wrapped in a fog of past and present deception, of course she has a hard time figuring things out. Plus her evil father’s mind-control power means she has hardly any memory of her childhood before he died. Well, this all makes for a dramatically more interesting novel. Plus Bitterblue is someone the reader can really get behind. She tries so hard to be a good queen. She is a genuinely kind, serious, responsible sort of young woman, caught in a terrifying and baffling situation. Plus she isn’t super beautiful or super clever or whatever. There’s a bit of a love triangle, but it’s not ridiculously intense, doesn’t get in the way of the story, and certainly doesn’t venture into Mary Sue everyone-falls-in-love-with-the-heroine territory. Also! Every single continuing character from Graceling is more complicated and more interesting in this book, from Katsa and Po right down the list. Giddon, a totally unimportant secondary character from Graceling, is far more important and interesting in this book. He’s a great character here, very possibly my favorite character in the book. Now that I’ve finished Bitterblue, I have read through a handful of Goodreads reviews. Quite a lot of them say something like this: The book was way too long, the pacing was terrible, the middle dragged, Bitterblue spent all her time waiting for something or other and not nearly enough taking effective action. My own response was different. I thought the waiting and the hopeless way Bitterblue would step into the fog of confusion and get thwarted and turn around and try again was fine. It felt to me like that whole middle part of the book deepened the fog that surrounded her and effectively wrapped the reader in that same fog. Also, it didn’t seem slow or badly paced because I zipped right through it. If a reader focuses mostly or exclusively on YA fantasy, then the book may well seem pretty slow. If a reader tackles a lot of long, involved, possibly slow-paced adult fiction, then in comparison Bitterblue may seem much faster. Compared to, say, the five-book Shadow Campaigns series that I read earlier this spring, Bitterblue was a quick, effortless read. But obviously your mileage may differ. I will add that some secondary character arcs are profoundly tragic. The things Leck did, and forced other people to do, and made everyone forget about — you can imagine the PTSD that resulted, and some of those stories do not have happy endings. I didn’t find the story hard to read; I found the presentation of those kinds of problems highly sympathetic, and, surprisingly, not too dark. But again, your mileage might differ. Overall: I really liked this one and I do recommend it, especially to readers who might have found the first book of the series a little simplistic and predictable. It really is an extremely different book from Graceling. I thought Bitterblue was a very sympathetic character, which makes a lot of parts pretty rough, since there isn’t any clear path forward for her as far as “the right thing to do” and she keeps losing people/finding out she can’t trust people. I will say, I thought her main love interest (I forget his name) was insufferably immature and I got really fed up with the plotline of them dealing with the fallout of his tantrum. But, it’s a minor quibble in a book I generally really enjoyed. Saf, and I agree. I found him tolerable mainly because that relationship was plainly not going to last, whereas Giddon seemed set to become the eventual romantic interest. Which does not play out in the book, but does seem where it’s headed at the end. I agree: it is a much more engrossing book than Graceling, which was a very fast, uncomplicated read. I was a little bummed that we didn’t see that resolution with Giddon, but it wouldn’t belong in that book. Really though, the book ends just when it seems like things are going to get better, and I want to see more of that happiness for all the characters. Basically, I want Bitterblue to have a Gratuitous Epilogue like the Touchstone Trilogy does. 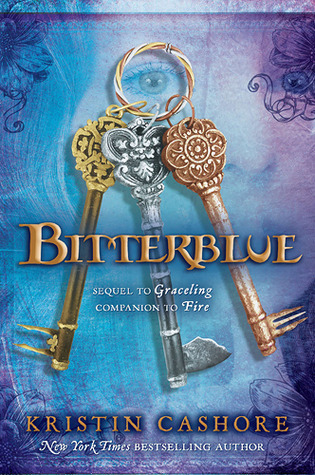 It’s years since I read it, but I liked Bitterblue a lot – more than Graceling but not quite as much as Fire (which is one of my favourite books). I didn’t mind the slower pace, because it seemed right for Bitterblue’s story and I was happy to spend that time with her. Mind control is not one of my favorite tropes, to say the least, so I am not super likely ever to pick up Fire even if it has other qualities I would like a lot. SarahZ, I agree, a lot of books could use a Gratuitous Epilogue! Onward with that! I’ve said it before: a gratuitous epilogue for Tehre would be wonderful. Hmm. You could be right. I’ll kept that in mind for when I do a second collection. It seems to me, I think, that the gratuitous epilogue we wish for would have to be found in fanfiction. We’ll simply have to take it or leave it.